If you would like to submit your own custom design to be printed on our postcards, your artwork should measure 4.125 x 6.125 inches. The final cut size will be 4 x 6 inches. Both sides of the 4 x 6 inch surface may be printed upon. However, the area on the back two inches from the bottom, and 4 inches from the right side of the card must be left white in order to mail the card. Any background color or images that you wish to have printed all the way to the edge should extend 0.0625 inches beyond the 4 x 6 inches for a total bleed-sized art piece measuring 4.125 x 6.125 inches (4 x 6 inches + 0.0625 inches extra on all sides). We recommend that most text be sized at least 10 points for best readability. Invite YOUR Community to church this Easter! 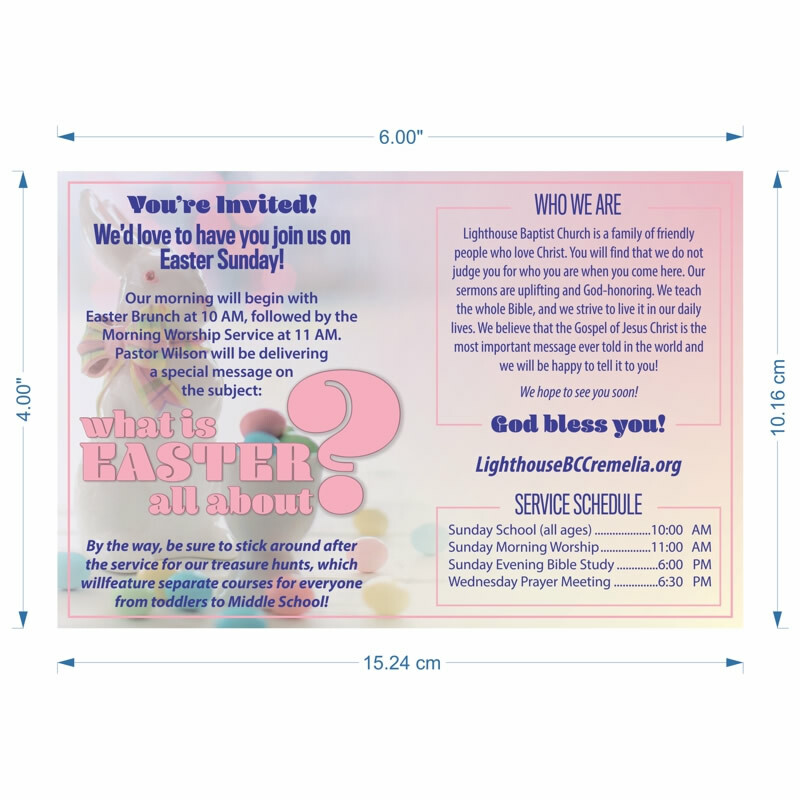 Postcards are the perfect Easter outreach tool. 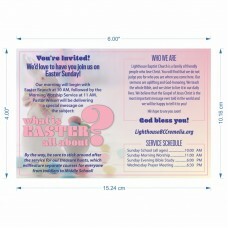 They are a great way to invite the community to your Easter service or other event. Your invitation will make it directly into their hands with little to no effort on your part. Our 4" x 6" 16 PT UV-Front only postcards meet USPS standards for mailing, and can be mailed with the lowest postage price. One side of our postcard has an attractive glossy UV coating. The UV coating protects your postcard from scuffs, improves the vibrancy of colors, and makes the card more durable. The other side of the postcard is un-coated so it can be printed or written upon and mailed without issue. Box The quantity of 250, 500 and 1000 will ship all together in one box. Quantities of 2500 and above may ship in 2 or 3 boxes, possibly of unequal weight. What do you want changed on the postcard? 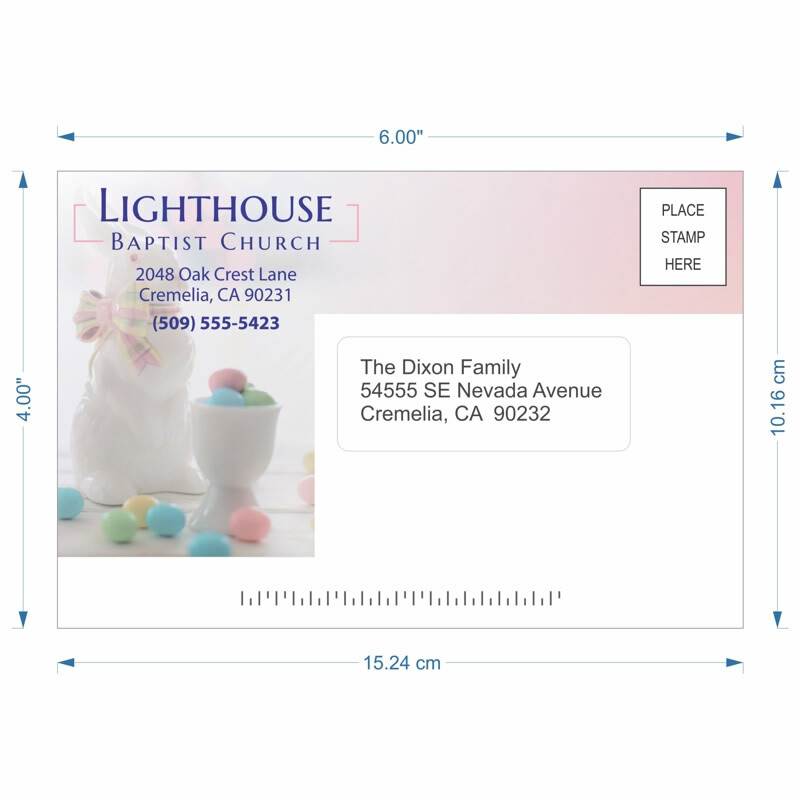 We will email you with personalized postcard for approval before we print. Other language, I will provide KJV.com with translated text. Choose tract, we customize, you approve, we print. What Happens When ..